Facebook is the largest social network, with more than billion active users. As of 2012 (when this book was written), every one out of five page views in the U.S. is on Facebook. Yes, unbelievable. 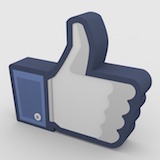 Facebook is a great service through which to grow your brand and engage with followers. To make Facebook work for you, remember to give more than you ask for. It’s not like the old style of advertising in magazines and TV. Facebook has the advertisement tool, but the best way to use it is to support the growth of your community. You can pay to boost your post in order to gain visibility. Your main focus, though, should be on giving great value and engaging your followers. Create not just great content, but content that people want to engage with. Facebook’s algorithm is designed in such a way that when a user interacts with your post (like, comment, click, share), then they will see more posts from you on their wall. That’s why creating great content is super important. Content you publish doesn’t have to be strictly related with your company. When you jab, the most important thing is to give value. The content you publish should be likeable. The time to sell will come after this. On Facebook, you can target certain demographics to display your post only to people that will care about it. For example, if you post about the Chinese New Year, you will want to display it only to the Chinese community. Make content that looks and feels good on mobile devices. Since 2013, Facebook has been a mobile company. Currently, most of the content is displayed on mobile devices, and most of Facebook’s ad revenue comes from mobile use. Take into account that when you publish something, most people will see it on mobile devices. It’s a cheap way to reach users who would not see your post in a standard way. Paying for a post is valuable in another way as well: When you pay and a lot of people engage with your post, the next time you post something, they will see it—even if you don’t pay anymore. You gain engaged fans. The great thing about sponsored stories is that you will pay less than your competitors if your story performs better and is more likeable. Make posts that are visually attractive. Avoid publishing too much text. Usually, text is not so relevant. What matters is a great, high-quality picture. Remember to place your logo on your image and include a clear call to action. First, people look at the image you publish. Next, they might read the text—or not. But the image is the most important element. The call to action is the second-most important element. What you want the user to do? Do you want them to share it? To like it? Or to install your app? Your post should be provocative, entertaining, or surprising. This is what it means to give value to your followers.